The Metroliner first appears in HO scale listings in Bachmann's 1972 catalog. The first actual appearance of an HO-scale model happens in 1974, prior years used N scale models for illustrations. The Metroliner remains in Bachmann's HO scale line through the 1980 product catalog. Metroliners return in Bachmann's 1987 catalog and disappear again. To date, they have not return to market. 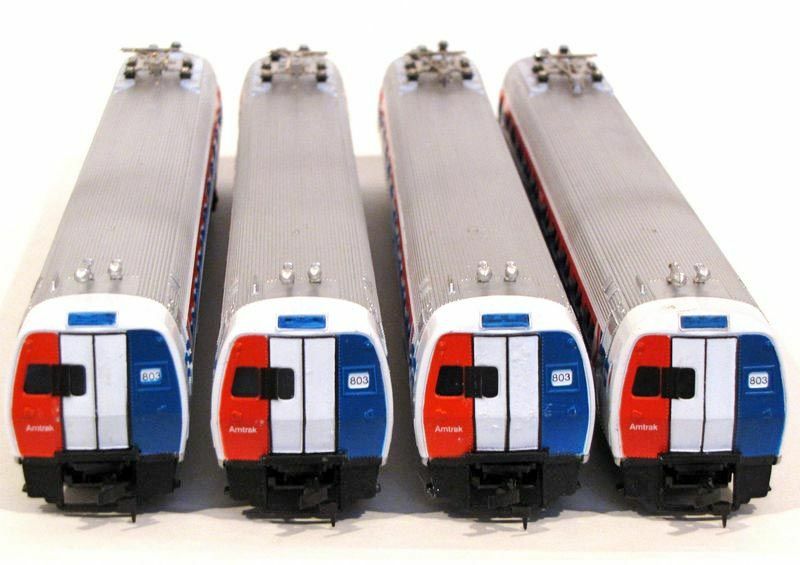 First Run Metroliners in HO were sold in 4-car sets. Models had drawbar couplers, working metal pantographs (made by a factory in Russia, I am told), and diecast metal underbodies. These early models also had small stirrups at B end under the doors at the end. These were removed from later production runs and it makes these early models somewhat more desirable, in my opinion. Inside, the interiors did not have the two pillars to keep the underbody from sinking higher inside the body. These pillars were added on later production runs. Power units had early Bachmann can motor and eight-wheel gear drive system. They had pulling power (according to a Model Railroader review in 1975) to pull 11 dummy units. Quite a powerful unit! Second distinct production run was produced in 1975 and was similar to the first except that the stirrup details were removed and the couplers were replaced by a new swivel gear system, a variation on which Bachmann still uses today in other models. Paint on these units was also improved slightly. Also, the underbody was now a one-piece plastic unit on the dummy cars. Third distinct production run in the early 1980's featured a change in mechanism to a tower-gear power truck with a pancake motor mounted on a plastic frame and a plastic pantograph on the roof. The front pilot and rear end bulkhead was cut away partially to allow for a new Talgo coupler design. Interestingly, the truck center spacing on these new units was made correct at a scale 59'6". Previous models were spaced wider, with the trucks closer to the ends, presumably to allow for tight curves. This had the effect of making the earlier models look longer. Walthers in the 1987 catalogue had a small batch of Metroliner HO body shells listed in the traction section. Presumably, these were extra inventory shells from Bachmann, and I believe they sold out quickly. The 1987 models were essentially similar to the early 1980's run, but with some slight modifications to the placement of the traction tires. Mike Bartel of Imperial Hobby Productions provided the information on this page regarding the variations of the Bachmann Metroliner. IHP has a small selection of replacement and detail parts for Bachmann and GEM brass HO Budd Metroliner MU models. Visit: Imperial Hobby Productions.